My Mom's turkey is unlike others. The breast meat isn't dried out, requiring cupfuls of gravy to taste good, but moist and flavorful. I've been watching her make our family turkey for years. Finally a few years ago she let me make it, giving instructions the entire time. Here I am, ready to put it in the oven. Mom's method is to buy the best quality turkey available (organic, free-range, etc.) and cook it breast-side down. She also cooks the turkey stuffing separately, not in the cavity, which makes it easier to cook the turkey more evenly. Preparation time: About 5 hours. 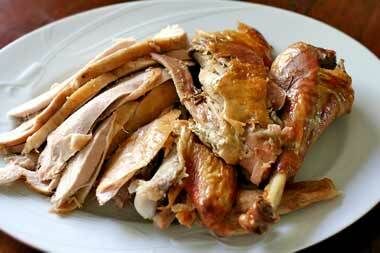 1 To start, if the turkey has been refrigerated, bring it to room temperature before cooking. Keep it in its plastic wrapping until you are ready to cook it. While in the refrigerator, and or while you are bringing it to room temp, have the bird resting in a pan, so that if the plastic covering leaks for any reason, you are confining the juices to the pan. If you get a frozen turkey, you will need to defrost it in the refrigerator for several days first. Allow approximately 5 hours of defrosting for every pound. 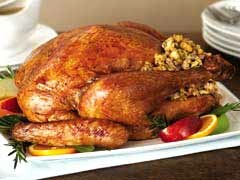 So, if you have a 15 pound turkey, it will take about 75 hours to defrost it in the refrigerator, or around 3 days. Handle a raw turkey with the same amount of caution as when you handle raw chicken - use a separate cutting board and utensils to avoid contaminating other foods. Wash you hands with soap before touching anything else in the kitchen. Use paper towels to clean up. Remove the neck and giblets (heart, gizzard, liver). Use the heart and gizzard for making stock for the stuffing. The neck can be cooked along side the turkey or saved for turkey soup. Note that if your turkey comes with a plastic piece holding the legs together, check the instructions on the turkey's package. Most likely you do not need to remove those plastic ties for cooking (unless you plan to cook your turkey at a very high temperature). If you remove the plastic ties, you will need to use kitchen string to tie the legs together. 2 Preheat the oven to 400 degrees F.
3 Wash out the turkey with water. Pull out any remaining feather stubs in the turkey skin. Pat the turkey dry with paper towels. Lather the inside of the cavity with the juice of half a lemon. Take a small handful of salt and rub all over the inside of the turkey. 4 In this method of cooking a turkey, we don't make the stuffing in the turkey because doing so adds too much to the cooking time. For flavor, put in inside the turkey a half a yellow onion, peeled and quartered, a bunch of parsley, a couple of carrots, and some tops and bottoms of celery. You may need to cap the body cavity with some aluminum foil so that the stuffing doesn't easily fall out. Close up the turkey cavity with either string (not nylon string!) or metal skewers. Make sure that the turkey's legs are tied together, held close to the body, and tie a string around the turkey body to hold the wings in close. The neck cavity can be stuffed with parsley and tied closed with thin skewers and string. 5 Rub either melted butter or olive oil all over the outside of the turkey. Sprinkle salt generously all over the outside of the turkey (or have had it soaking in salt-water brine before starting this process). Sprinkle pepper over the turkey. 6 Place turkey BREAST DOWN on the bottom of a rack over a sturdy roasting pan big enough to catch all the drippings. This is the main difference between the way mom makes turkey and everyone else. Cooking the turkey breast down means the skin over the breast will not get so brown. However, all of the juices from the cooking turkey will fall down into the breast while cooking. And the resulting bird will have the most succulent turkey breast imaginable. 7 Chop up the turkey giblets (gizzard, heart, liver). Put into a small saucepan, cover with water, add salt. Bring to simmer for an hour or so to help make stock for the stuffing (see stuffing recipe). 8 Put the turkey in the oven. Check the cooking directions on the turkey packaging. Gourmet turkeys often don't take as long to cook. With the turkeys mom gets, she recommends cooking time of about 15 minutes for every pound. For the 15 lb turkey, start the cooking at 400 F for the first 1/2 hour. Then reduce the heat to 350 F for the next 2 hours. Then reduce the heat further to 225 F for the next hour to hour and a half. If you want the breast to be browned as well, you can turn over the bird for the last 15-20 minutes of cooking, at an oven temp of 300°F. (Oven must be at least 250°F for browning to occur.) Note that if you do this, you will have a higher risk of overcooking the turkey breast. We never worry about browning the breast. Start taking temperature readings with a meat thermometer, inserted deep into the thickest part of the turkey breast and thigh, a half hour before the turkey should be done. The dark meat in the thigh should be about 175 F. The white meat in the breast should be 160 F to 165 F. If you don't have a meat thermometer, spear the breast with a knife. The turkey juices should be clear, not pink. 9 Once you remove the turkey from the oven, let it rest for 15-20 minutes. Turn the turkey breast side up to carve it. Scrape all the drippings off of the bottom of the roasting pan. Pour drippings into a smaller skillet. Ladle off excess fat with a gravy spoon and save for possible use later. In a separate small bowl take a quarter cup of corn starch and add just enough water to dissolve the corn starch. Beat cornstarch with a spoon to remove lumps. Slowly add the cornstarch mixture to the drippings, stirring constantly. You may not end up using all of the cornstarch mixture. Only add as much as you need to get the desired thickness. Allow time for the cornstarch to thicken the gravy. Add salt, pepper, sage, thyme, or other seasonings to taste. 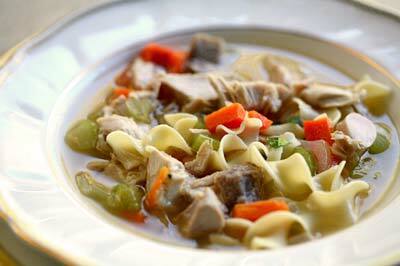 When you are finished with your turkey, save the bones from the carcass to make a delicious turkey soup. This is my grandmother's recipe, which my mother has been using to make our Thanksgiving turkey stuffing for more than 40 years. 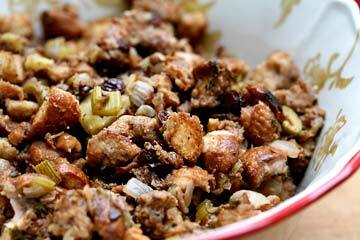 I've never tasted any turkey stuffing that has come close to as good as Mom's. Although years ago we used to stuff the bird, these days we cook the stuffing separately. It is much easier to get an even cooking of the turkey (and safer too) if you do not stuff it. To infuse the stuffing with turkey flavor we simmer the giblets for an hour, and use that stock in the stuffing. 1 If you haven't already made the stock, take the turkey giblets - heart and gizzard - and neck if you want, and put them in a small saucepan, cover with water and add a little salt. Bring to a simmer; simmer for about an hour, uncovered. Strain the stock into a container for use with the stuffing. Alternatively, you can use chicken stock or just plain water with this recipe. 2 Toast the walnuts by heating them in a frying pan on medium high heat for a few minutes, stirring until they are slightly browned (not burned) OR put them in the microwave on high until you can smell the aroma of them toasting, about a minute or two. Let them cool while you are toasting the bread, then roughly chop them. 3 Heat a large sauté pan on medium heat. Melt 3 Tbsp butter in the pan, add the bread cubes, and stir to coat the bread pieces with the melted butter. Then let them toast; only turn them when they have become a little browned on a side. Note, if you aren't working with somewhat dried-out day-old bread, lay the cubes of bread in a baking pan and put them in a hot oven for 10 minutes to dry them out first, before toasting them in butter on the stove top. The bread should be a little dry to begin with, or you'll end up with mushy stuffing. 4 In a large Dutch oven, sauté chopped onions and celery on medium high heat with the remaining 3 Tbsp butter until cooked through, about 5-10 minutes. Add the bread. Add cooked chopped walnuts. Add chopped green apple, currants, raisins, olives, parsley. Add one cup of the stock from cooking the turkey giblets or chicken stock (enough to keep the stuffing moist while you are cooking it). Add sage, poultry seasoning, salt & pepper. 5 Cover. Turn heat to low. Cook for an hour or until the apples are cooked through. Check every ten minutes or so and add water or stock as needed while cooking to keep the stuffing moist and keep it from sticking to the bottom of the pan. Every Thanksgiving my mother takes what's left of the turkey carcass and makes a delicious turkey soup that we enjoy for days. The first step is to make the stock, which you can get started on right after dinner. 1 Remove all the usable turkey meat from the turkey carcass to save for making sandwiches later or for adding to the soup. 2 Break up the leftover bones of the carcass a bit, so they don't take up as much room in the pot. Put the leftover bones and skin into a large stock pot and cover with water by an inch. Add any drippings that weren't used to make gravy, and any giblets (except liver) that haven't been used already. Add a yellow onion that has been quartered, some chopped carrots, parsley, thyme, a bay leaf, celery tops, and some peppercorns. 3 Bring to a boil and immediately reduce heat to bring the stock to a bare simmer or just below a simmer. ( If you would like to have a clear stock, keep the stock below a simmer, as the more you simmer, the more cloudy the stock will be.) Skim off any foamy crud that may float to the surface of the stock. 4 Add salt and pepper, about 1 tsp of salt, 1/2 tsp of pepper. It sort of depends on how big your turkey is. You can always add salt to the soup later. 5 Cook for at least 4 hours, uncovered or partially uncovered (so the stock reduces), occassionally skimming off any foam that comes to the surface. To help maintain a steady, even heat, you can cook the stock in a 180°F oven. 6 Remove the bones and veggies and strain the stock, ideally through a very fine mesh strainer. 7 If making stock for future use in soup you may want to reduce the stock by cooking it longer, uncovered, at a bare simmer or just below a simmer, to make it more concentrated and easier to store. Prepare the turkey soup much as you would a chicken soup. With your stock already made, add chopped carrots, onions, and celery in equal parts. Add some parsley, a couple cloves of garlic. Add seasoning - poultry seasoning, sage, thyme, marjoram and/or a bouillion cube. Cook at a bare simmer until the vegetables are cooked through. (Or you can sauté the vegetables in a little fat rendered from the soup first, and add back to the soup right before serving.) You can add rice, noodles, or even leftover mashed potatoes (or not if you want the low carb version). Take some of the remaining turkey meat you reserved earlier, shred it into bite sized pieces and add to the soup. You may also want to add some chopped tomatoes, either fresh or canned. Add salt and pepper to taste. Sometimes a dash or two of Tabasco gives the soup a nice little kick.